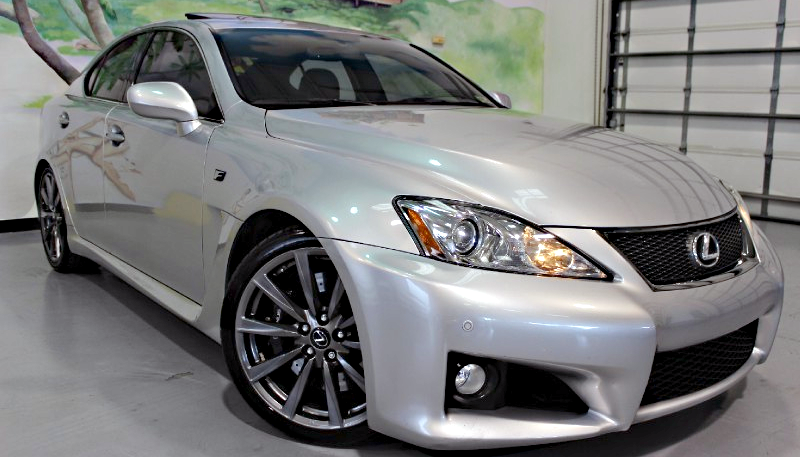 Why Buy A Toyota Camry When You Can Get This Lexus IS-F For Less? Decisions, decisions. In today's unfair-o comparo, you can either get a Japanese car with great reliability, or a Japanese car with great reliability, a 416 horsepower V8, a Mark Levinson sound system, and brake rotors big enough to serve large pizzas on. Life can be so difficult sometimes, am I right? This Lexus IS-F was supposed to be a BMW M3 killer. It may have missed the mark by this much, but it's still one hell of a performance cruiser. Personally, I love its looks and think it's the best looking Lexus this side of the LFA. Its angular, aggressive styling continues all around the car, giving the car the illusion of going ludicrously fast while standing still. OPTIONS INCLUDE: NAVIGATION, HEATED SEATS, KEYLESS-GO, MARK LEVINSON SURROUND SOUND, SUNROOF, BLUETOOTH, REAR CAMERA, FRONT AND REAR PARK SENSORS, 19in SPORT WHEELS, XENON LIGHTS, AUX PORTS, MULTI-FUNCTION STEERING WHEEL CONTROLS, CARBON FIBER TRIM, PADDLE SHIFTERS, V8 AND MORE. I'll add to the awesome by saying that a bumper to bumper warranty is available, this car has all service records, a clean history, and a decent amount of miles for the year. There are no clutches to burn out, and most of the maintenance/repair parts on this car can be purchased reasonably through the aftermarket or through Toyota directly. With its 8-speed transmission and direct injection, it can get surprisingly good fuel mileage, and it'll last forever if you take care of it. It looks better than most new cars today, and a brand new, nearly $100k Lexus IS-F looks identical to this one. You can buy this, or a new Toyota Camry V6, for more. Yep. Makes perfect sense.